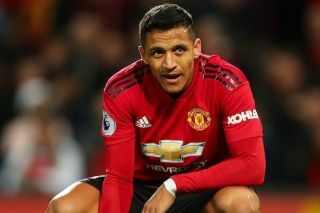 Paris Saint-Germain are reportedly eyeing up a transfer swoop for Manchester United forward Alexis Sanchez after his struggles at Old Trafford. There can be no doubting now that the Chile international has massively under-performed since his January move from Arsenal, scoring just four goals for the Red Devils since then. Still, it seems Sanchez remains highly rated around Europe as PSG are talked up as being prepared to take a gamble on him, though there may be a key condition to that possible move. Given Sanchez’s big dip in form, it seems the Ligue 1 giants would now only be willing to take the 29-year-old off United’s hands for a cut-price deal or perhaps even only on a free transfer, according to the Sun. United won’t be too pleased with that, but then again they may also feel it’s worth just getting this flop off their hands as quickly as possible after a disastrous spell in Manchester. Alexis Sanchez to PSG after Manchester United struggles? The Sun adds that PSG could be keen on a big-name signing like the former Arsenal and Barcelona man as they face the prospect of losing either Neymar or Kylian Mbappe next summer. It remains to be seen if Sanchez really has it in him to replace them anymore, though he has of course long been one of the finest attacking players in world football, and could perhaps benefit from the less competitive nature of the French top flight.